Mattis said Iran might be able to be swayed by "a purely cost-benefit ratio." "Between economic sanctions, diplomatic isolation, and encouragement of behavior that does not cost them such a degree of political support that they end up losing power, there may yet be a way to bring them to their senses," Mattis said. 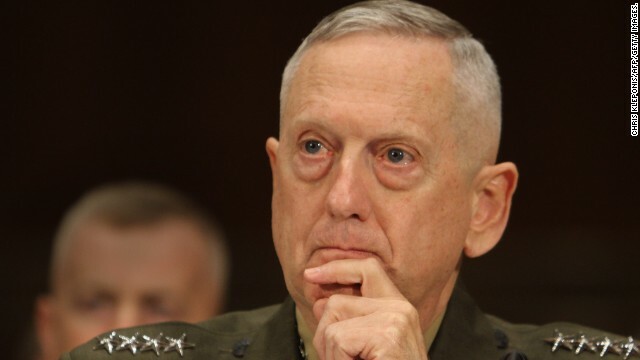 Asked by Graham if the only other option is bringing them "to their knees," Mattis responded, "yes, sir." "The means, there are a number of means to do that, perhaps even short of open conflict. But certainly that's one of the options that I have to have prepared for the president," the Central Command chief said. Secretary of State John Kerry told CNN's Jill Dougherty in an interview conducted in Doha, Qatar, that the United States was willing to sit down with Iran, but the country needs to prove it has only peaceful purposes for its nuclear program. Over the weekend, Iran's ambassador to the United States told CNN's Fareed Zakaria that Iran was open to direct talks. "I'm willing to do what the president instructs me to do, and the president calls that shot. But he has already made it crystal clear, going back several years, that the president is prepared to engage with Iran," Kerry said in his first interview with CNN since becoming secretary of state. "He prefers a diplomatic solution to any kind of military option. And he has said that he is prepared to engage in bilateral conversation. So that option is open." Iran's ambitions were also the focus of a meeting between Defense Secretary Chuck Hagel and Israeli Defense Minister Ehud Barak at the Pentagon on Tuesday. Hagel said the United States believes the "window is closing" on diplomacy, according to a summary of the meeting provided by the Pentagon. Divorce and the military can be a complicated issue. Divorce is an emotional roller coaster for anyone. I came up witha new operation ""PORK CHOP JUBILEE""""We start parachuting LIVE hogs down to their countries Tell them its BBQ TIME!!!! These sanctions AKA pieces of paper saying don't do this and that, are obviously not working. Its not working in North Korea and its not working in Iran. I am totally against being involved in other peoples business, But we need to do something. We need to have a worldwide law prohibiting the making of any nuclear weapon and it needs to be enforced militarily. This stuff has to stop. Personally I think it would be a good idea to destroy any and every nuclear bomb making facility in the world. If these countries want to make nuclear weapons, The plants should have to be on ground neutral to all countries, Like Antartica. Build your nuclear weapons there and have them regulated out the yin yang, Have to receive permission from a board of leaders from every country in the world to access them. Thats how it needs to happen. Senator Lindsey Graham probably knows a ting or two about "bringing them to their knees". Sanctions must target the Ayatollah, if this RAT does not feel the pain, anguish, despair nothing is going to happen. Islamic clerics don't care about their people, as opposed to other religions, Islamic clerics indoctrinate brainless Muslims to become terrorists and commit all kinds of atrocities, they never die for someone else, like Buddhist monks. Muslim clerics enjoy killing, torturing people because they can maintain their power. So the sanctions aren't working, no big surprise. The real game going on is the military needs a new war because we're out of Iraq and getting out of Afghanistan. What to do with all that hardware over there and unemployed Generals? Sanctions havent & will not work to get Iran to stop their nuke program. Force of arms is the only way. Diplomacy has failed miserably here. Decades of failed diplomacy. You are right! We, the USA, do a terrible job in diplomacy! This has been going on for decades, just as you say. Our diplomats are very niave, no "street smarts" at all! What happened to the "reset button" given to Russia? Nothing! We don't know how to talk with Putin, and subsequently ignore him. A strong and friendly relationship with Putin could solve many problems, but we do nothing. Hillary flew all over the world but spent little time with Russia. Meanwhile, Putin builds a huge pipeline to sell more gas to Europe. He doesn't need tanks, soldiers or nukes to take over control of Europe! Every gas valve is on Putin's desk. What the hell do you think he has in mind? Putin is a bigger threat to the West than NK and Iran combined! All you fanatic A holes on all sides – remember war is NOT the answer. On the otehr hand, respect, rule of law by ALL countries and good intentions by ALL countries is what we need on this small planet, otherwise, we will all within a couple of generations have to seriously look at immigrating to anotehr planet and probably within a few hundred years we'll ruin that planet too. I find it very interesting that only a handful of countries have nuclear weapons, and teh major ones (US, Russia, China, UK, and France) are the only ones on the Security Council, which is a jock and they only have veto rights – none of these countries ever allow others join the permenant SC members, and they veto propsals that is not to their advantage, or against one of their allies and wait..........they are the same countries/members who dictate otehrs cannot have nuclear weapons. In fact one of tehse countries has actually used nuclear weapons and other WMD's against others (ALL third world countries) in wars. I believe we have a word in our languarge for this kind of people....it is called HYPOCRITE. I wish all countries woud abolish nuclear weapons. We all have enough classical weapons to kill teh entire planet several times over. Instead spend the money on eduacting people, teaching tolerance, teaching ALL religons are bogus – if there really is a God, and he has all this power we talk about, then doesn't need Jesus, Moses, Mohamad, and others who claim they are his representatives to come on earth to tell us about him. If he exists and is as powerful as some seem to think, why doesn't he get rid of pain, intolerance, wars, murder, WMD's, ....... unless he eitehr doesn't exist, or is not as nice as some say he is. Be smart – be tolerant of others and respect one another – do NOT push you ways on others, even if they are better ways – that is how we ALL will survive. Peace on Earth. If Iran want's a nuclear weapon let's give them a couple.. Exactly the ugly American response that the world has come to expect. Every naive American comment like this convinces countries like Iran that their only hope of avoiding an American pounding is to get nuclear quickly. They are racing to accomplish it and I'll wager they will have them before we ever "give them a couple". John...if you are going to Post then please check your facts first. As to your incorrect assertion that the US is the only country to ever shoot down a civilian plane....I am thinking you are naive about the Korean Air Line plane shot down by the Soviets by one of their fighter planes after he had visual contact of that plane in International airspace under peace time conditions..unlike the Iranian plane that was shot down by US missiles that was shot down in a Hot war zone as the US ship had already come under attack that day by Iranian gunboats in International waters.The US navy had already sent out a No Fly warning to all local air traffic controllers...including Iranian whom by the very definition of Air Traffic Control...Flew their own civilians Into a hot war zone. I passed this line of logic by my 3rd grade 8 year old who correctly answered Who killed Whom? He got it right the first time around...you have it backwards. Would you like to try again? Have you passed your 3rd grade exams on logic yet? On your blind accusations of how many "innocent Iraquis" the US soldiers killed in Iraq...were you there on the ground counting KIAs with bullets whizzing by you? Or are these "facts" just more misconscrewed logic on your part? When I was serving my country in Iraq I found it very difficult to accurately count opposing forces KIAs while under fire and after skirmishes often times the enemy would collect their dead before US forces could declare an area safe to move about in. When did you do your counting? How did you ascertain your "accurate body counts"? How many armed opposing forces did you kill who were trying their very best to kill you? I know I killed the fu#k out of anyone firing on me and am proud of it. In war there is only one winner at the end of the day...the guy or gal that is still alive. There is no second place finisher. On your comments regarding the US...I seriously hope you never get to be a citizen of our great free land..the people that died for you in all our wars so you can be a safe and prosperus hypocrite would rather spit in your eye before they listened to the likes of you! America...Love It or Leave It! you have said it all southbaydave62,God bless you. Everything is going according to plan. Your going to have a real eye opener coming soon. Well, how'bout dismantling Medicare, Medicaid and Social Security for Americans to finance yet another war with yet another lunatic (Ahmadinejad) and make the IPAC (pro-Israeli lobby) happy? Back to your cave Abdul! Im not an expert, but it appears as though the rich get richer, and the poor get poorer. Meaning the sanctions are hurting the peaceful people of Iran who dont have adequate funds, while the Rich people of the government could care less about the sanctions, because they and their loved ones are well taken care of. A country who openly claims to want to wipe another country off the face of the earth does not want peace. Dont kid ourselves either, Israel is not the only country in danger, if Iran could and had the power too they would love nothing more than to take a bomb and blow up one of our college stadiums with sixty plus thousand in attendance. Who are the nice people of islam? Bane beat them to it. Sanctions have only made Iran stronger, by making them self reliant. Something that a lot of our fellow Americans could stand to learn. I would disagree with that statement, Iran is not stronger. In fact overall they are militarily weaker. The sanctions failed to stop the nuclear program but that should not be a surprise to anyone, sanctions are stupid. Iranians are having to pay double and tripple pre-sanction price for most foods. This makes the people pretty peaced off with the leadership. Lies will not advance your cause. @Lobby,wrong bud,just depending on more outsiders to give to their wims than before as countries like Russia,China and others give humanitarian aid but at a cost,crude oil! !Iran would be an island of to itself if it weren't being influenced by outside communist countries telling them basicly to hang in there because these same countries that are fighting for Irans cause will ultimately benefit from Irans vast crude production facilities being first to barter for that one commodity! !If Iran would come around it'll help their countries people and Irans government really doesn't care about them do they!! You sound like a new generation American. Complain complain complain. Complain Complain. Blame someone. Repeat. How do you know he is American? Its a phoney name anyway, mate. Check out the english... This is the official line in iran. Thats probably where he is sitting. Ever heard of KAL 007. Also I highly dispute your claim of 1,000,000 dead innocent Iraqis. I have no doubt that some innocent Iraqis died but quite honestly better innocent Iraqis than innocent Americans. youre a communist in my eye!!!!! @JohmSmith,aren't you that famous Mormon moron..Hey quit posting the same crap on all sites,either be original or stay off,plain and simple nitwit!! @Pete: John Smith a Mormon? hahahha i think you forgot that Romney was all for blasting the shiz out of Iran and anyone else who threatened the US. Let this fool express himself, he's probably in the Iranian government or something and will be dead or out of a job soon enough. I agree though, his random crap is annoying, especially since he just re-posts the same garbage over and over again. Can we kick this guy off the island? The US continues to be the most belligerent county on the planet. If Iran doesn't already have dozens of nuclear weapons, they better get busy and build them. Iran has prefect rights to build a bomb to counter these bullies. It is a shame that official from US openly threatening Iran with attack and war. These people are criminals and should be behind the bars. Notice that the US doesn't have any 'other options' ready for N.Korea, like they used to...I wonder why that is? Its not out of any fear of NK's military. The tiny US force in South Korea & the South Koreans would walk all over the North. The gating factor is, in any outright confrontation, the South would pay a huge price in being bombed in the openings moves. Their capital, Seoul, is well within the NK's missile/artillery range. Seoul would be badly damaged.